Bahama-Style Shutters enhance the tropical look of your home while offering everyday use and protection. 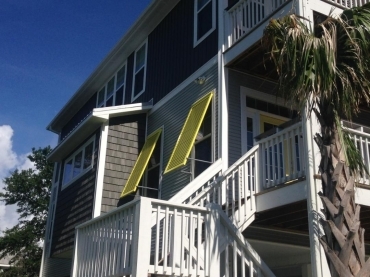 While still allowing a cool coastal breeze, the Bahama-Style Shutter provides shading protection from the sun. The added privacy benefit of Bahama-Style Shutters eliminates the need for interior window blinds or shutters, while still allowing in light and air flow in the closed position. Bahama-Style Shutters' strong, aluminum construction provides the look of conventional wooden shutters with years of trouble-free finish and minimal storm protection performance. Our Bahama-Style Shutters are constructed of aluminum with stainless hardware, which leaves the final product on your home practically flawless. There are many different color options to match doors, house trim, roofs, or just to give a home that certain spark that it is lacking. Unlike wood shutters, the Bahama-Style Shutters durable powder-coated aluminum will never rot and won't require regular painting. 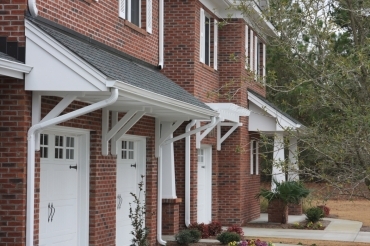 Our experienced craftsmen can create whatever specialty application you may need for your residential or commercial job. We use materials such as redwood, cedar, pressure-treated pine, and synthetic/composite materials to enhance your home or business. © 2019 Carolina Custom Exteriors. All rights reserved. Web Design & Hosting by Wilmington Design Co.